The apartment is a beautiful 2 bedrooms air conditioned apartment on the top floor. The master bedroom has an en suite bathroom with bath and shower over as well as its own access to the terrace. All bedrooms have fitted wardrobes with plenty of hanging and drawer space. The bedrooms are well equipped with all you would expect of superior accommodation. There is a large flat screen television with all satellite channels and a dvd player. In our apartment, the kitchen features all modern conveniences including full size oven and hob with extractor hood, fridge, freezer, dishwasher, microwave, toaster, coffee machine, electric juicer etc. There is a full size washing machine and separate tumble dryer located in a small utility room. The lounge/dining room has a satellite equipped TV, typical portuguese seating for up to 6, a feature fireplace, dining table for 2 to 6 people, coffee table and access to a large fully equipped private terrace (loungers, table and chairs, sunshade, etc). The lounge sofa converts into a comfortable double bed. Imagine....tumbling out of bed and walking just a few yards to the clubhouse and first tee. When you've finished your round on this little gem of a 9 hole par 3 course, take a leisurely dip in one of the 6 outdoor pools close by.... or perhaps a workout in the gym followed by a few lengths of the indoor pool or laze in its corner Jacuzzi. Or perhaps even a session in the steam room and a relaxing massage. Later, take a little tennis or a bucket of balls on the 50 bay driving range. Want to improve your game?... at Balaia you can take lessons from the professional at the village's own golf school. Alternatively....you and your family might prefer a quieter existence; taking a leisurely breakfast on the terrace listening to the 'thwack' of driver on ball as others work out their frustrations. Then a gentle walk to one of the beautiful nearby beaches - Sta Eulalia and Maria Luiza beaches are just a few hundred metres away - for an afternoon of sun, sea and siesta. Later, you can while the night away in one of the many bars, restaurants and clubs in the nearby bustling resort of Albufeira or take a stroll to the beautiful 'A Varanda' restaurant in the village. This village offers the perfect setting for a wonderful family holiday. 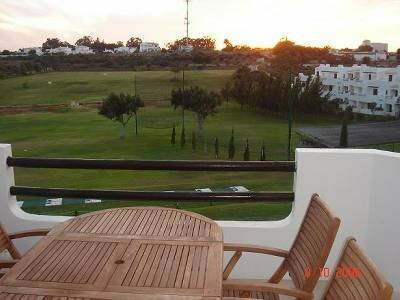 4 Star accommodation with Portuguese style large wooden dining table and furniture and a beautiful view on to the driving range and a new gas barbeque.